Our Whippers In: M. Richard Glaude, M. Claude Robert and Mrs. Margaret Smith. Our Field and Honorary Secretary: Christine Allard. Francois Seguin is the present huntsman for the LTMH Club. He undertook this posiiton when Alfie Smith retired. It is with his help and that of Ret Lt Julien Allard which has made it possible for him to take on this position. The Masters of Foxhounds offerend a course in how to become a huntsman and or improve upon you present skils. He love the course and presently enjoys taking on this new position. The kennesl are situation at Forever Green Stables in Glen Robertson, Ontario. 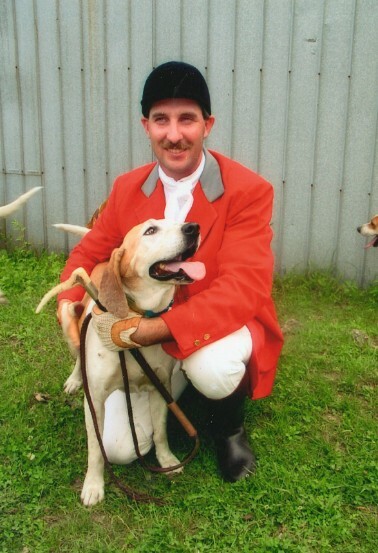 There are approximately 35 Pennmarydale fox hounds. We chose this smaller breed as the new hunting territory is smaller and more condensed and these hounds are more suited to such a terrain. They have beautiful voices and are easy and fun loving dogs.